Our Jola series Liquid Sensor OWE 2C offers a solution to Diesel Leak Detection. Petrochemical storage areas and tanks are always under pressure to monitor and control tank leaks. Fuel leakages emit vapour generating hazardous area. Protecting the environment and safety are two major concerns for most industries involved in either production, transportation or storage of fuels. While there are various means to detect tank overflow, only few sensors can pick up an actual leak to couple of millimeters. Again, conventional leak sensors are meant to pick up conductive liquids (water etc), diesel is not conductive so the traditional leak sensor will not work. A gas sensor on the wall will also not pick up a diesel leak as diesel does not give off any gas fumes at rooms temperatures. Jola’s Diesel Leak Sensor is the only guaranteed method for diesel leak detection. 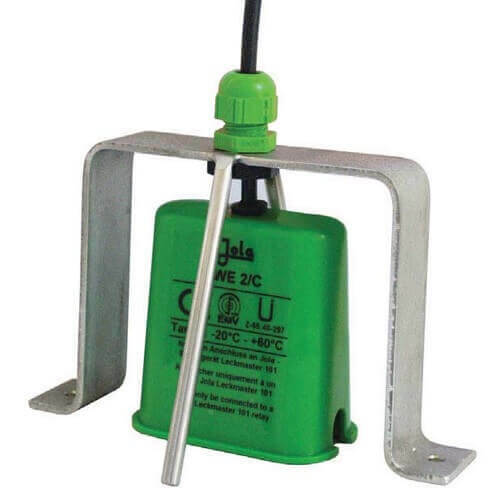 Jola’s Diesel Leak Sensor is suitable for most other non-conductive liquids, for example motor oil etc.